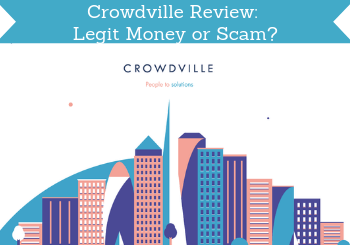 Crowdville Review: Legit Money for Your Opinion or Scam? According to Crowdville, it is a site where you can become a Crowder and contribute to the creation and improvement of digital products and services by giving feedback. But is Crowdville legit and what is it exactly you can do on the site? You, of course, need to know this before joining. This in-depth Crowdville review will show you exactly what it offers and how to use it, so you can easily see if it will be worth it for you or not. What is Crowdville and what does the site offer? Crowdville was started in Italy in 2014 but has since expanded to more countries and now has over 40,000 members. Still a small site compared to other survey opportunities online, but big does not always make it better. But what exactly does Crowdville then offer? I must admit that when I first heard of it and joined, I was a little confused about how exactly it works. I, however, managed to figure it out by looking around, testing, and by asking questions to the support. Below I will, therefore, explain it so it will be easy for you to see right away what you can expect and if it is a site for you. When you sign up for Crowdville, you become what is called a Crowder. This means you can participate in their missions, which is the main way to earn on the site. It is quite different from other survey sites and is as much a product testing site, but also not like most other product testing sites. I, honestly, quite like the different approach and the potential of the site, but more about that later. Let’s for now just focus on what it offers so you can see and judge for yourself. As a member, you can see the available missions. You need to first complete your profile to be able to apply to participate in a mission. It takes less than 5 minutes to complete your profile. Missions are usually in the tech industry, and you have to test apps and give feedback about them to earn. Often apps that have not been released yet, as the creators want it tested properly before releasing them. This makes it a pretty cool opportunity to get to test new apps before anyone else. It can be a range of different apps from big brands in telecoms, the media, banking, and more. A mission usually consists of different parts – mostly a survey part where you give feedback about your experience with the app and an option to participate in bug finding in the app. Both of these options pay quite well in relation to time spend compared to many other survey sites. Whenever you join a mission, you will see a description of what you need to do step-by-step. You get each step for the missions explained. The survey is something you usually have to do after you have tested the app to get paid. This is how the creators get feedback and are able to improve their services. Reporting a bug is not something you have to do. But what it means is that if you, while testing an app, notice something is not working, you can report the bug. The creators of these apps are of course interested in finding as many bugs as possible before releasing the app. So if you participate in the bug finding, you will get extra rewards for this. Usually, there will also be a bug finding competition as a part of a mission. If you are the one that finds the most bugs, you win an extra reward in addition to the rewards you have already earned by answering the survey and reporting the bugs. You can earn a bit extra by inviting your friends to join Crowdville. If a friend joins, you will get 5% in commission when they earn. This does, of course, not mean they will earn less. They will earn the same no matter what – the commission is paid by Crowdville to you as thanks for telling other people about it. In general, before inviting any friends to a survey opportunity, I, however, also encourage you to first of all check it out yourself and make sure it is something you want to recommend a friend. But if you know people that might be interested in joining, it can be a way to earn a little extra even though it will not be much. There is a whole section on Crowdville called community. The design and navigation of it are not yet great, but if you can live with this, it is important to know about the community aspect. It is not a way to earn but you can find some important info here. You can, for example, see the blogs for your specific country where a lot of news and tutorials are posted. Also, when you participate in a mission, there will be a group for that mission where you can ask questions if you have any. In addition to this, you can also use the Crowdville community as a kind of social media and share your thoughts and post. The community section works as a social media but also has a lot of important info. You can also add friends and send messages. Personally, I spend enough of time on social media as it is:-) So I will probably not be using the social media aspect much. But the community section is a very good place to go to find more info about how Crowdville works and to keep an eye on the news on the platform. Now you know how you can earn on Crowdville and what else you can do on the platform. It is, of course, also very important to know how you can then get paid. You earn cash every time you participate in a mission and do surveys + bug finding. You can then get this cash out either through bank transfer or through PayPal. So great ways to get paid, in my opinion. And there is no payout threshold, so you can take your earnings out when you want to, which is also great. If you participate in bug finding and win a competition, the prize for this will, however, usually not be in cash but an Amazon gift card. But since you can get basically anything on Amazon, it is as good as cash. The big question for any survey and product testing site is then, of course, how much money you can then make. The rewards for participating in missions on Crowdville are actually quite good. In the UK they pay up to £15 for each survey completed and up to £14 for each bug submitted (if the bug is accepted by their bug team). In addition to this, winners of the bug competitions can win somewhere between £45-£90 as a gift card. It is important to mention that these are examples for the UK. The rewards will vary from country to country and depending on the mission. So some nice rewards you can earn. BUT you also have to be aware that it does not have unlimited opportunities. In some of the countries where it is available, it is still just in the pilot phase and you might, therefore, find few opportunities. But in other countries, you will find regular opportunities. You should, however, not join if you expect to make a full-time income or become rich from it. Yes, you can definitely use Crowdville on mobile. You can, in fact, use it on any device. You can use Crowdville on any device. Since most of the missions are about testing an app, you will actually mostly need a smartphone to participate in the testing. Many of the other things like answering the surveys, reporting bugs, etc. can be done on any device. Crowdville is still a fairly new platform – especially in most parts of the world. It started in Italy, and this is also where you will find the most opportunities. It has, however, expanded to the UK and Portugal. I have been told that they are also planning to expand to further countries in the future. But at the moment of writing this review, it will mostly be relevant to join if you live in the UK, Italy, or Portugal. However, you can join from anywhere and there might occasionally be missions you can participate in from anywhere in the world. But if you are not from one of the countries above, it will require a lot of patience and then you are better off joining sites in your country instead. Also, be aware that in the UK it is still a very new site and still just in the testing phase. So there will not be a huge amount of missions, but it can definitely be worth getting in from the beginning. Being able to get support is important on any survey site. It tells a lot about the company behind and what you can expect. On Crowdville the main way to find support is, first of all, to go to the community section on the website. Here you can find support for your missions in the groups and there is also a blog where a lot of frequently asked questions are answered. Crowdville also has a Facebook page for each country it is mainly available in. You can also send them a message here. I have written with Crowdville several times myself, as I had several questions about the platform. I have received quick and helpful answers which tells a lot about a company. Great and helpful support is something I appreciate a lot on survey sites. Crowdville is definitely a legit site and a legit opportunity to earn some extra cash online. This does not mean it will necessarily be the right option for you. So let’s sum up the pros and the cons of the platform so you can get a better overview before deciding to join or not. Overall, I think Crowdville is a nice site. The only thing you have to be aware is that it is still in the development and expansion phase, so in some countries, there are still not a lot of missions – but this will hopefully change as the platform grows. Other than that, it has some interesting missions, it gives good rewards, you can get your earnings out when you want to, and it offers to pay in cash, and is therefore definitely a site worth considering. I hope this review has given you a good overview of what Crowdville has to offer and who it is for. If you want to join, you can read below how to do it. It is quite easy to join Crowdville. Just click the button below and you will be taken to a sign-up page where you have to register. It takes less than 1 minute. If you have any comments, questions, or have any experiences with Crowdville yourself, I would love to hear from you in a comment below. Crowdville is an interesting survey and product testing site where you can earn by testing apps and sharing your opinion about your experiences. It is still new and in some countries still in the development phase. But overall it offers good rewards in relation to time spent, no payout threshold, and great payout methods. If you live in the UK, Italy, or Portugal, it is a site worth checking out.